Procrastination and Task Avoidance is another one of Dr. William McCown’s premier works, covering an intriguing area of psychology, procrastination. For those who want to better understand the complexity in this common, yet often debilitating behavior, the authors bring together theory, research and application. They explain the interwoven elements of anxiety, depression, passive-aggressiveness, perfectionism, agitation, conscientiousness, and other related characteristics, regarding this behavior that affects life satisfaction in 25 percent of all adults. Up until Procrastination little scientific attention was given to his characteristic, which is often at the root of problems in human productivity and happiness. The authors speculate that the trait may have been considered too minor or too “flippant a topic to be granted much scientific credence.” However, they say it is both a contributor and an outcome of psychiatric conditions, negatively impacting productivity in work, school, families, and relationships. where authors clarify and define the topic, so that the reader sees how the behavior might have developed, how it is best measured, how it is nested in personality and clinical syndromes, and how it might be modified. Adult Inventory of Procrastination McCown found scores for men reach a peak in the mid to late 20s, then decline until about age 60, when scores begin to go up. For female scores decline from a high in the early 20s, and are lower than males. But then at age 60, females’ procrastination scores rise and are higher than for men. McCown also examined over 1500 college students and found that 19 percent of freshmen, 22 percent of sophomores, 27 percent of juniors and 31 percent of seniors indicated that procrastination was a significant source of personal stress. In Chapter 2, “ Procrastination Research,” authors examine childhood personality development, the behavioral perspective of reinforcement, escape, and avoidance conditioning, the role of state anxiety, and of specious rewards. They review cognitive and cognitive-behavioral theories with irrational beliefs, self-statements, locus of control, learned help- lessness, and irrational perfectionism. Sections on depression, low self-esteem, and anxiety are included, along with how procrastination relates to achievement motivation, intelligence and ability, impulsivity and extraversion. Authors also note the neuropsychological and biological variables. In Chapter 3, “The Use of Self- Report Measures,” assessment methods are described, including McCown’s and Johnson’s Adult Inventory of Procrastination (AIP), the Mann’s Decisional Procrasti- nation Scale, General Procrasti- nation Scale, and Procrastination Assessment Scale-Students. result in avoidance. They clarify the fear of failure, procrastination, avoidance, big five characteristics, and self- worth, then flow into specific treatment of academic procrastination. Chapter 5 is “Trait Procrastination, Agitation, Dejection, and Self- Discrepancy,” and the author defines how discrepancies between “ideal self” and actual evoke emotions of disappointment or shame, and how discrepancies between the “ought self” which represents duties and responsibilities evoke fear and uneasiness. In “Dimensions of Perfectionism and Procrastination,” Chapter 6, authors explain the distinct dimensions of “other-oriented perfectionism,” (the individual sets unrealistic standards for others), “self-oriented perfectionism” (the standards apply only to oneself), and “socially-prescribed perfection- ism” (concerns meeting expectations of others). Within this multidimensional perspective authors delve into correlational research and suggest a fascinating set of issues, including how socially- prescribed perfectionism correlates with fear of failure. optimism. Included is a model for overall adjustment. In Chapter 8, “The Role of Personality Disorders and Characterological Tendencies in Procrastination,” authors explain the relationship between procrastination and personality disorders. Specific guidance for treatment is offered in Chapters 9, “Treatment of Academic Procrastination in College Students,” and 10, “Treating Adult and Atypical Procrastination.” Authors include the common cognitive misconceptions of individuals who procrastinate, such as overestimation of time left to perform a task, underestimation of time needed, and overestimation of future motivation. Authors also describe a 10-session group approach with detailed instructions and point out the need for a careful and full assessment because of many issues that can be overlooked, such as stress or the “addiction” to procrastination. 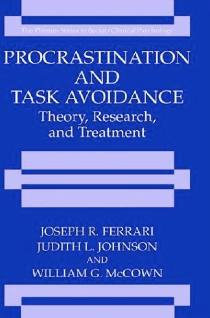 Procrastination and Task Avoidance is an informative, interesting, and worthwhile text for clinicians and research psychologists who deal with the human condition. The content is still quite useful, even though Dr. McCown may be planning to update. “I hope we can put out a second edition soon,” he noted. That would be a treat. Dr. William G. McCown, clinical psychologist, professor, and international consultant, is the coauthor/editor of eight books. He has held various positions in the U. of Louisiana at Monroe, including Director of Training and interim Associate Provost. Presently he is interim Director of the Graduate School. since this occasion i am reading this wonderful informative post here at my home.